Our Take: Dive bar in the front, family friendly neighborhood joint in the back. That’s not weird, is it? Stuff yourself with the triple-decker Bobby Burger at a rock-bottom price. Upgrade to the Fire Fries—cheese fries doused with hot sauce—and don’t forget to take your Prilosec. Our Take: The cheese is strictly American, your only vegetables are pickles and onions, and the bun is basic. But the whole is more than the sum of its parts: juicy, fresh, perfectly seasoned. We like ours with a bag of the salt-and-vinegar Dirty Kettle chips. Our Take: It’s dark, and cozy, and always welcoming. 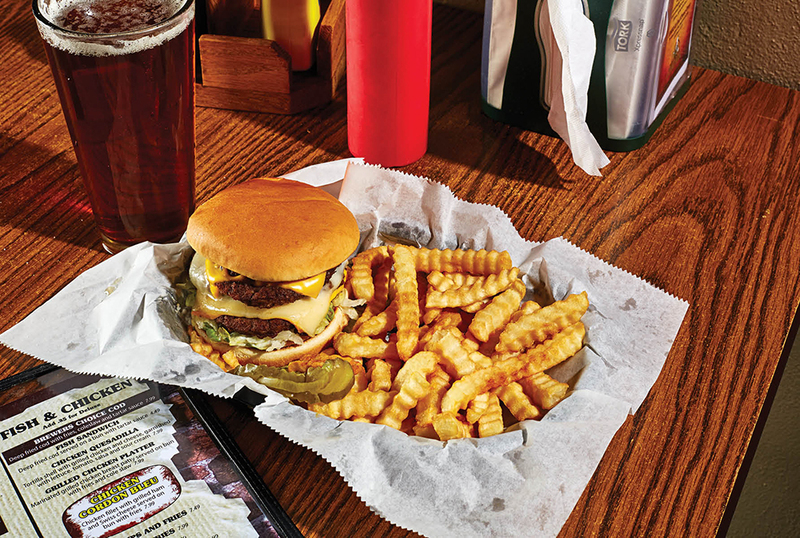 The half-pound Gas Light Burger is the star, but it’s supported by solid onion rings, standup waffle fries, or (our favorite) crisp crinkle fries. The choice is up to you. Our Take: New owners rebooted this Ft. Thomas mainstay late last year. The signature burger comes with American cheese, bacon, egg, and housemade ketchup. Both meats come fresh from Ebert’s Meats in Newport, so you’re supporting two locally owned businesses at once. Our Take: On Thursdays, if you buy a burger, you get a second for $5. We couldn’t resist the Georgetown Village, which is stuffed with blue cheese, blackened, then covered with Roquefort dressing. We chose the fresh-cut fries on the side instead of a salad.